Eco-conscious actors don’t necessarily work on eco-friendly sets. But the film industry is starting to take action. If you’re up on your celebrity gossip, you’ll know Bradley Cooper recently drove to dinner with his ex in a Prius, and Jennifer Lawrence shops at Whole Foods with colourful, reuseable shopping bags. Green living is now par for the course for much of Hollywood (aside from the jet setting and 10,000-square-foot homes), with some of the biggest names in show business championing climate action, wildlife conservation and marine protection. The Leonardo DiCaprio Foundation, for example, is “dedicated to protecting earth’s last wild places,” while Avengers star Mark Ruffalo actively lobbies for renewable energy and protests fracking. Woody Harrelson, meanwhile, co-founded a company that makes paper out of straw waste. But when the curtain is pulled back, how green is the industry behind the actors? Pinning down the impacts of a business as transient as last summer’s box office bomb can be a challenge. Shoot locations can change daily or weekly, sets are thrown up and torn down, swarms of extras needing to be fed and watered come and go. One of the most comprehensive environmental assessments conducted on the biz comes out of Green Screen Toronto, and the numbers unearthed were pretty alarming. • A single mid-sized TV series can consume up to 57,000 water bottles and 810,000 sheets of paper per season. • A large show’s trucks, trailers and generators can burn through up to 175,000 litres of gasoline and 17,000 litres of diesel (which helps explain how UCLA estimated California’s film and TV sector releases nearly a quarter of the air pollutants that the state’s petroleum refineries do). • Once you’re at the blockbuster movie level, you’re talking a staggering 200,000 water bottles and up to 1,000 tonnes of set construction waste for every film. Splice it all together and you’ve got one Godzilla-sized environmental footprint. And that doesn’t include the climate-changing carbon embedded in it all. The best figures on the sector’s greenhouse gases come out of the United Kingdom, where the British Academy of Film and Television Arts leads industry-wide carbon footprint reduction programs. In a 2014 report, it concluded that for every hour of on-screen TV, the industry chokes out 9.4 tonnes of CO2 – more than the average European produces in an entire year. This is where the audience gasps and questions whether Hollywood’s clean, green hero image is all smoke and mirrors. So what are the protagonists doing about it? More and more studios, producers, directors and, yes, actors are working on rewriting the script with a happier, planet-friendly ending. Stars like Brad Pitt and Ben Affleck are opting to chill in trailers with biodiesel generators, solar panels and recycled countertops, as is the entire cast of American Horror Story and the Fantastic Four. Sony Pictures’ The Amazing Spider-Man 2 managed to divert 52 per cent of its waste, donating nearly 6,000 meals (leftovers from crew lunches) to local shelters, not to mention the 193,000 water bottles they avoided by rolling out reusable water canisters and water filling stations on set. And when Fox brought the popular show 24 back last spring for a revival season, it managed to keep even more waste out of landfills, diverting an impressive 98 per cent of waste. It also relied on 100 per cent Forest Stewardship Council certified wood for its sets. These days, all the major Hollywood studios – Warner Bros, DreamWorks, Disney, NBCUniversal, Paramount, Sony, Fox – actively promote green production practices. Many have zero-waste diversion targets on studio lots. A couple have carbon emission reduction targets for films and shows. But that wasn’t always the case, says Debbie Levin, president of the Beverly Hills-based Environmental Media Association. Since 1989, EMA has focused mostly on influencing the influencers, getting celebs to go green and seeding environmental content in scripts and on camera. Levin’s board decided to launch the industry’s first green certification program for films and television programs. The EMA Green Seal has now been stamped on over 500 productions, including awards shows and films such as 50 Shades of Grey, Annie and Gone Girl. 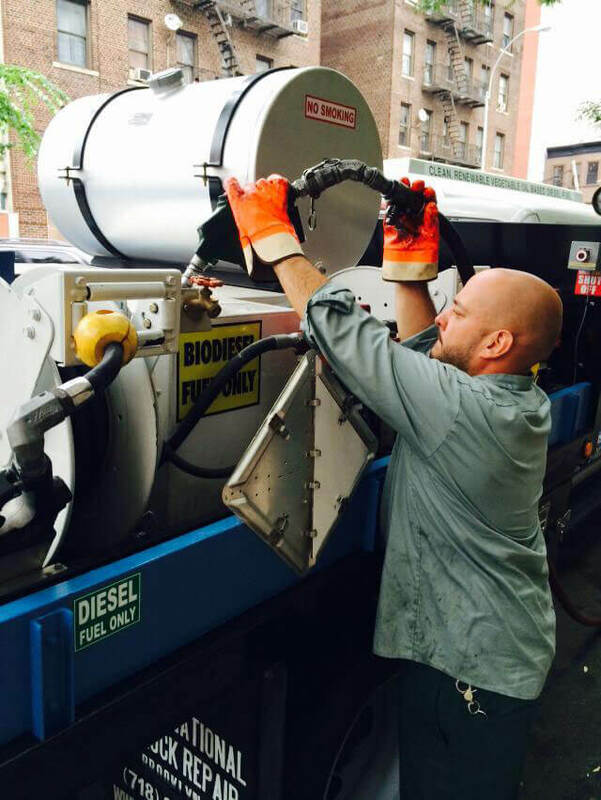 One worker on a set fills an on-site power generator with biodiesel fuel, which is cleaner diesel. Nonetheless, critics point out that while most of the studios encourage “best practices,” there’s not enough in the way of mandatory greening on set. At 20th Century Fox and Sony’s Columbia Pictures, every production is asked to do carbon footprinting, while NBCUniversal’s corporate sustainability executives regularly touch base with production teams to advise on greening sets. But instituting enviro practices is still largely optional on most sets, and really depends on the mix of cast and crew behind the scenes. A bigger name actor on a successful show might have some sway, says Levin, who is currently working with an actress from ABC’s Scandal to replace on-set water bottles with filtrated taps. But on the greenest films, insiders say, it generally takes an environmentally committed producer to take things beyond the status quo. The Producers Guild of America has been fostering just that since it released its Green Production Guide in 2010. The guide lays out best practices, a carbon calculator and a handy app that connects users to over 2,000 green film-friendly vendors across North America. Still, Miller admits, a certain amount of fatigue can set in both for the people doing the reminding and for those being reminded to recycle and turn off their engines. By the third season of Warehouse 13, drivers were slipping and started idling again, despite a no idling policy. “For it to work it has to be grassroots,” he says. 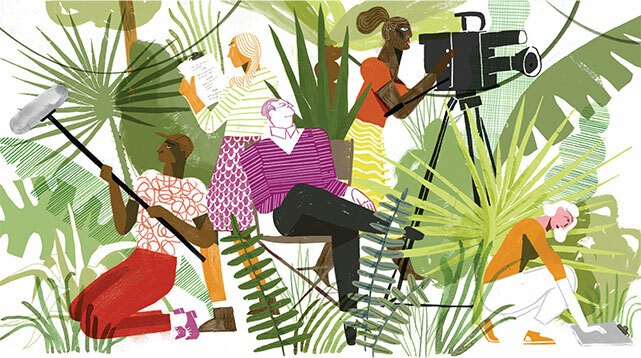 To help entrench buy-in from crews, all the film and television unions need to make greening a priority, not just the producers union, argues Hurd. As it stands, North America’s biggest such union, IATSE (the International Alliance of Theatrical Stage Employees), has no system-wide programs for weaving sustainability into the job. Emellie O’Brien, founder of the New York-based green production consultancy Earth Angel, says it’s unfair to place the burden on tired, overworked crew. What productions really need, if they’re truly serious about keeping sustainability initiatives going, is a dedicated eco-crew member. Earth Angel was hired by director Darren Aronofsky to ensure his environmental blockbuster about a biblical flood, Noah, was as green as possible. It was also behind the greening of Annie and The Amazing Spider-Man 2. These days, O’Brien is actively lobbying the studios to create a line item in budgets reserved for the hiring of an on-set green crewmember. The job, she argues, will pay for itself through cost savings. 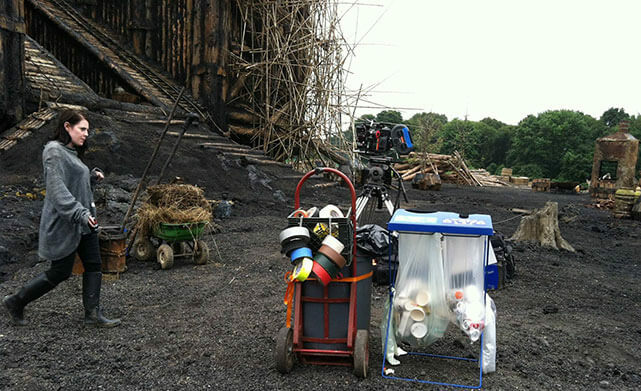 An Earth Angel crew member collects recyclables on the set of Noah. Case in point: Sony Pictures has proudly promoted the fact that the sustainability practices in place on The Amazing Spider-Man 2 saved the studio an estimated $400,000. Disney has already caught on, mandating at least one full-time environmental steward on set on all its feature films, such as 2015’s Tomorrowland, shot in Vancouver and starring George Clooney. Which brings us to the next leg up for aspiring green films: location, location, location. Lisa Day, director of energy initiatives at 20th Century Fox, says it’s a lot easier to green your film if you’re shooting in L.A. or New York City than, say, in South Africa or Budapest or other places where green vendors and infrastructure are less likely to exist. As a rule of thumb, shooting anywhere on location tends to have a much bigger footprint than filming on permanent lots with energy-efficient studios and nearby warehouses filled with borrowable sets. Possibly the greenest production location in North America is in British Columbia, says Day, explaining that most of the grid power comes from emission-free hydroelectric plants and Vancouver crew are deeply engaged on the issue. “Your carbon footprint goes way down,” she says. Industry trends are also helping – but not always. The mass movement to digital format means the processing pollutants involved in old-fashioned film reels are long gone. More and more productions are using hyper-efficient LED lights, which in some cases can be plugged into a wall without having to rely on giant diesel-burning generators. On the other hand, the rise of green screen and CGI animation means a much bigger power draw on computer and data centres. Filmmaker James Cameron is trying to rectify the situation for his Avatar sequels by hoisting 960 kilowatts of solar energy onto studio rooftops. Despite high profile cases like Avatar, such deep greening remains patchy, says O’Brien, mostly because of the lack of universal, industry-wide regulations and standards. Unlike the United Kingdom, where BAFTA spearheads carbon footprint reductions – and reminds its members that CO2 emissions “must be reduced by 80 per cent by 2050 in line government targets for the UK” – North America’s Academy of Motion Picture Arts and Sciences has kept quiet on the issue. Without a centralized push, it’s tough to shift on-set greening from a nice-have to a necessity. Luckily for Hollywood, there’s always room for a new script.